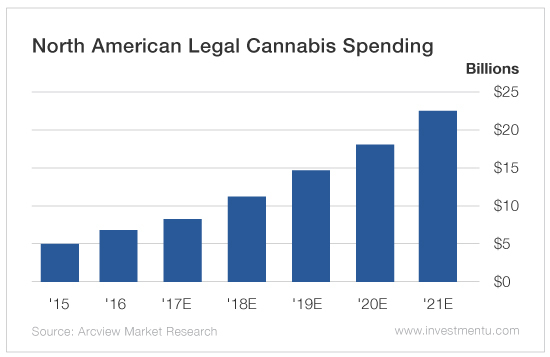 Last year, legal cannabis spending reached $6.7 billion in North America - a 30% increase over the previous year's sales. That figure is expected to rise another 22% this year to about $8.2 billion. And by 2018, cannabis spending should top $11 billion. That growth is being driven by a wave of legalization initiatives that have opened up new markets for the budding industry. Eight states and Washington, D.C., have legalized the recreational use of cannabis. And 29 states have legalized medical cannabis use. Cannabis is still illegal on a federal level. Under the Controlled Substances Act of 1970, cannabis is classified as a Schedule 1 substance, putting it in the same category as heroin and LSD. However, there's a debate over the validity of this classification. In fact, new legislation was recently introduced that would effectively "reschedule" cannabis as a Schedule 3 substance. That would put it in the same category that contains combination products such as Vicodin and Tylenol with codeine, which are commonly used under medical supervision to treat pain. Legal cannabis spending accounted for only 13% of the overall cannabis market in 2016. When you include the illegal cannabis market, total spending was actually a whopping $53.3 billion. That means the illegal market is SIX times larger than the legal market is. That's a market ripe for expansion when, not if, cannabis is fully legalized. Just how large is the medical cannabis market? Many people think the marijuana industry is driven by hippies and college students. However, most of the legal sales so far are for medical use. In 2016, recreational use accounted for just one-third of spending. Medical use accounted for the rest. Cannabis-based treatments are often used to treat a wide range of conditions, including back pain, sleeping disorders, glaucoma and depression. Cannabis can also be used to treat multiple sclerosis. GW Pharmaceuticals (Nasdaq: GWPH) is at the forefront of plant-based cannabinoid treatments for neurological conditions. Its flagship drug, Sativex, treats the spasticity symptoms of multiple sclerosis. The drug has already been commercially licensed in 16 countries outside the United States and has regulatory approval in an additional 12 countries. Another one of GW's cannabis-based drugs, Epidiolex, is designed to treat Lennox-Gastaut syndrome and Dravet syndrome - two rare forms of epilepsy. And so far, it's been proven to drastically reduce seizures in patients, compared with the results from those taking a placebo. But these treatments reflect a small portion of the medical cannabis market. According to the market research firm New Frontier Data, North American sales for the medical cannabis market alone will reach $24.5 billion by 2025. Last year, the regional medical cannabis market raked in about $4.9 billion. That means this market is set to grow 400% within the next several years. According to a recent CBS News polls, around 61% of Americans think cannabis should be legal... 88% think medical cannabis use should be legal... and 71% don't want the federal government to interfere in states where it's already legal in some form. Suffice it to say, the tides are shifting. Now it's just a matter of when, not if, cannabis will be legalized throughout the U.S.
P.S. Emerging Trends Strategist Matthew Carr used to be skeptical about cannabis investing. But recently, a transformative new law has changed his mind. Click here to read his report on the legislation that could send North America’s cannabis industry to new highs.